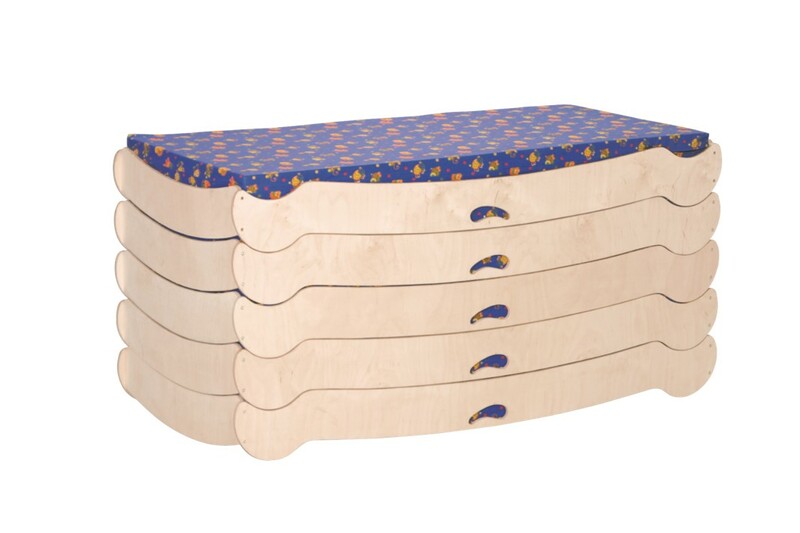 Wooden stackable nursery beds are ideal for use in nurseries, play groups and pre-schools. These Stackable Nursery & Playgroup Cot Beds with Sleep Mats have been specially designed for early years use and feature rounded corners for increased safety. Stacking Cot Beds for Nurseries can be stacked when not in use, for easy space saving storage. Constructed from a lightweight plywood frame with a child-friendly finish, these Stackable Nursery & Playgroup Cot Beds with Sleep Mats have a natural feel and make nap time a breeze. The cotton covered foam mattress provides early years children with a comfortable sleeping place for the perfect nap. This nursery rest bed has easy to clean surfaces so keeping your nursery beds in a pristine and hygienic condition has never been easier. Low edges allow children to independently climb or crawl onto the stackable nursery beds. Available as individual rest beds or in packs of 5 for a discounted rate. For more information on the Stackable Nursery Beds, please contact us or call us on 01733 511 121.